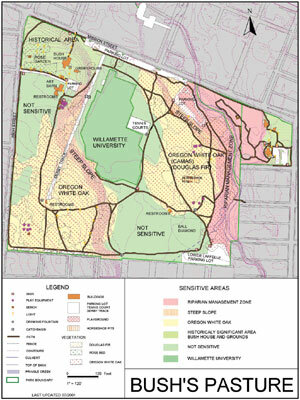 A final sensitivity area map for Bush's Pasture Park. Growing public concern for environmental issues, along with government responsibilities to comply with environmental regulations, has propelled local governments in the Pacific Northwest to address how their action or inaction affects the natural world. In addition, in June 2000, the National Marine Fisheries Service published its Endangered Species Act 4(d) Rule for Salmon and Steelhead. 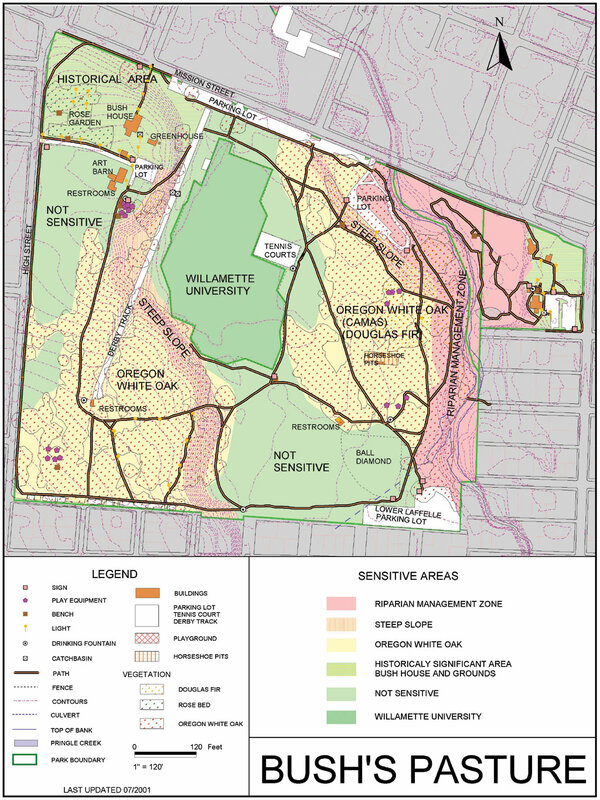 Taken together, these prompts stimulated the Parks Operations Division of the city of Salem, Oregon, to undertake a study to identify and address environmentally sensitive areas within its city parks. Parks Operations began to look at the potential effects of city park planning, management, and use of environmentally sensitive areas. The goal of the study was to locate, identify, and map environmentally sensitive areas along with areas of high use in city parks. In addition, best management practices (BMPs) were identified through research and a steering committee made up of city staff and citizens. The Sensitive Area Management Handbook was born from that goal. "The handbook establishes a strategy for the management of sensitive areas in Salem parks," says Rick Scott, Parks Operations and Planning administrator for the city. "The handbook has a separate map and best management practice description page for each park and maintains continuity over all the parks." Prior to the Sensitive Area Management Handbook, most existing park maps were sketches, outdated master plans, or simple parcel boundaries. The sensitive area study had to create both basemap features and an overlay of environmentally sensitive areas. To do this a combination of existing citywide shapefiles, aerial photography, and field data was used. A map of the Livingston ArcView project file for the sensitive area study. When it came time to choose GIS software, the city took many factors into account. Consequently, to help prepare the handbook, the city chose ArcView as the best platform to combine existing spatial files with new files and data collected using GPS. The study team used georeferenced digital orthophotography as a base to create new shapefiles for major park features such as paths, parking lots, and buildings. Features that were not identifiable on photographs because of object size, tree cover, or age of the photograph were located and mapped in the field using GPS. Teams composed of two park staff members used a Trimble GPS Pathfinder system, with submeter accuracy, to collect field data at each city park. During these same visits, GPS was used to delineate sensitive features such as the drip lines of native tree stands, edges of wetlands, springs, and the tops of banks for creeks and rivers. The field data was then converted to ArcView shapefile format and used with the city's existing shapefiles to create accurate basemaps for each park. Once basemaps were created, the natural and man-made features of each park were used to create an environmental sensitivity layer. The sensitivity layer was created using sensitive features identified in the field and those identified from existing shapefiles such as contours, landslide hazards, and the Local Wetland Inventory. Riparian Management Zones were generated using ArcView software's Create Buffer tool on the creek top-of-bank shapefile. Creeks that were identified as being salmon bearing received a 150-foot buffer while all other creeks were given a 50-foot buffer to help improve water quality. All analysis and map design was done on a citywide basis to maintain continuity throughout the handbook. A single ArcView template project was used to ensure that the styles and legends for all the park maps were standardized. This enabled maintenance and planning personnel to become familiar with the sensitive area designations and reduce confusion when working in different parks. The sensitive area maps were exported and incorporated into Corel WordPerfect to produce the final hard copy of the handbook. Electronic copies of each map were stored in separate ArcView projects and made available to staff. Updates made to the sensitive area projects will automatically update the electronic copy of the handbook. Printed updates will be added to the hard copy periodically. The Sensitive Area Management Handbook contains summary descriptions of identified sensitive areas and BMPs. 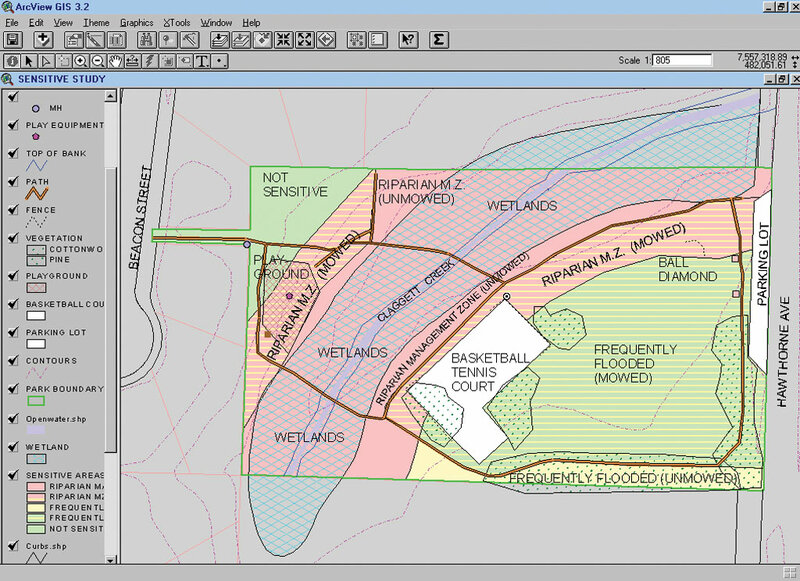 Currently 65 parks have separate sensitive area maps and BMP tables in the handbook. In addition, conflicts between current management practices and the listed BMPs are identified for each park. "Printed in 2002," says Scott, "the Sensitive Area Management Handbook is a road map of how unique areas of the city's park system will be maintained, enhanced, and preserved for future generations." For more information, contact Jude Geist, GIS technician, Parks Operations Division, Salem, Oregon (e-mail: jgeist@mail.open.org, Web: www.cityofsalem.net/~parks/sensitive_area.htm).